Foie gras is a cruelly-produced, high-priced “gourmet” delicacy that comes from force-feeding young ducks (or geese) until their livers swell to eight or more times their natural size. Foie gras (French for “fat liver”) is the diseased liver of an animal who has suffered enormously. That’s why California’s 2004 ban (which went into effect in 2012) on the production and sale of foie gras was a momentous step forward. 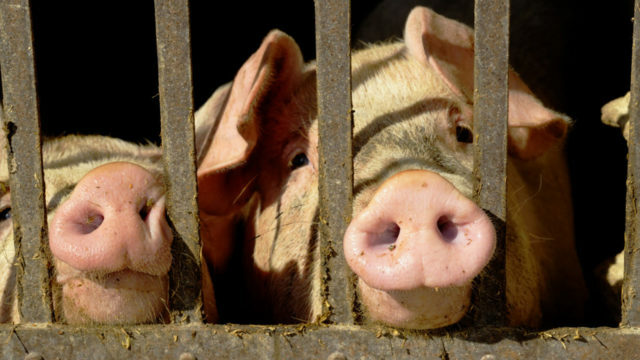 But on January 7, 2015, a U.S. District Court overturned California’s ban, treating animals as “goods in commerce” rather than as living, sentient beings. That misguided decision flies in the face of state law, voter desires, and the Animal Legal Defense Fund’s legal victories against the foie gras industry. 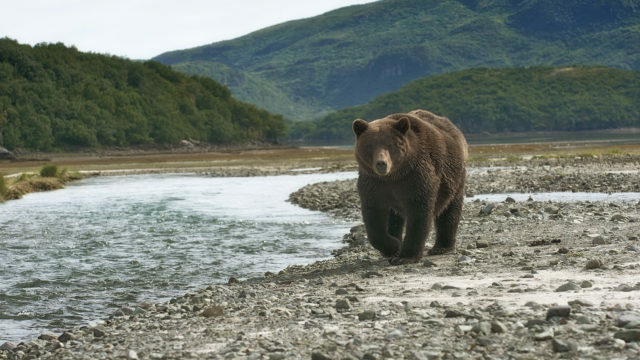 On February 4, Attorney General Kamala Harris appealed this recent ruling, and the Animal Legal Defense Fund expects the ban will be reinstated. A day in the life of a bird raised for foie gras includes several force-feedings in which a thick pipe is rammed down his throat and huge amounts of grain pumped directly into his stomach. Free time is spent crammed in extremely small, dirty pens. Infection and painful punctures in the beak and throat are common, and many ducks cannot move normally and become too heavy for their legs to hold them. When ducks get sick from these conditions, human workers may simply throw them into a trash heap. The ducks who survive are eviscerated and their diseased livers sold as food by producers such as New York’s Hudson Valley Foie Gras (HVFG). Previous investigations into Hudson Valley Foie Gras revealed appalling conditions. Dead ducks tossed into garbage cans or lying alongside living ducks struggling to breathe, unable to escape, with untreated sores left festering. Hudson Valley Foie Gras, the largest U.S. producer of foie gras, once tried to define itself as “The Humane Choice” in its promotional materials while brutalizing ducks for gourmet profits. That’s why in 2012, the Animal Legal Defense Fund filed a landmark lawsuit against Hudson Valley Foie Gras—it was the first time a humane competitor used false advertising laws in a federal case alongside an animal protection group. Ella Nemcova, a co-plaintiff in the Animal Legal Defense Fund’s suit, owns a Brooklyn-based company called The Regal Vegan, which produces a legitimately humane and plant-derived foie gras alternative called “Faux Gras.” HVFG’s false advertising violated state and federal laws by unfairly urging consumers to buy force-fed foie gras rather than cruelty-free products like The Regal Vegan’s. the Animal Legal Defense Fund withdrew that lawsuit after Hudson Valley Foie Gras removed its deceptive “humane” language. Unfortunately, the law breaking didn’t stop there. Some restaurants in California (and the producers who supplied them) didn’t want to lose the bankroll they made from animal cruelty, and protested the state ban enormously. Several wantonly violated the humane values put forth by the voters of California. They colored themselves as anti-ban heroes, despite engaging in inhumane and illegal activity. However, the courts did not agree with that portrayal of their illegal activities. For example, in July 2013, the Animal Legal Defense Fund won a legal battle against Napa, California-based La Toque restaurant for illegally selling force-fed foie gras products. 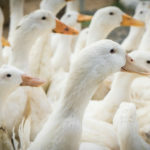 La Toque appealed the Animal Legal Defense Fund’s victory by claiming that breaking the law to sell cruel products was “freedom of speech.” Napa County Superior Court scoffed, and agreed with the Animal Legal Defense Fund that illegally selling foie gras is not free speech protected by the U.S. Constitution. 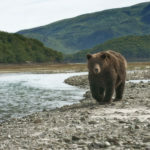 The next month, in August, 2013 the Animal Legal Defense Fund achieved one more victory when the Ninth Circuit Court of Appeals upheld an earlier decision denying a temporarily lifting of the ban. The Animal Legal Defense Fund, along with Farm Sanctuary, HSUS, Humane Society Veterinary Medical Assocation,and the Marin Humane Society, filed an amicus brief in that case. On January 27, 2014 the Ninth Circuit denied a request by a coalition of foie gras producers to rehear their constitutional challenge against California’s ban. A smaller panel of judges had previously ruled that the foie gras ban was constitutional. On October 14 2014, the Supreme Court declined to review the case, allowing the ban to stand. But the fight does not end there. Even though foie gras is the result of swollen and often diseased livers that result from force-feeding an animal unnaturally, it is regulated by the New York Department of Agriculture and Markets and sold in New York restaurants as a food product. In September 2012, the Animal Legal Defense Fund filed a lawsuit against the New York Department of Agriculture and Markets, warning that in not declaring that foie gras comes from diseased animals, the Department puts consumer health at risk – and violates New York state laws. This lawsuit also named foie gras producers Hudson Valley Foie Gras, Bella Poultry, and La Belle Farms, who profit from the sale of diseased poultry. Foie gras has been banned in over a dozen countries. Force-feeding damages the livers of the birds so badly it induces an extremely painful disease known as hepatic lipidosis. Scientific studies also show that consumption of foie gras is associated with a fatal disease in humans called secondary amyloidosis. Hundreds of thousands (and possibly millions) of birds have been slaughtered and their diseased organs sold into the human food supply for the financial profit of foie gras producers. Foie gras is produced by force-feeding young birds until their livers swell to eight or more times their natural size. The Animal Legal Defense Fund launches the foie gras restaurant tracker form for people to report illegal foie gras sales in California. With the ban on foie gras again in effect in California, the Animal Legal Defense Fund resumes its case against Napa restaurant, La Toque, for serving foie gras. January 7, 2019 – Victory! The Supreme Court denies the foie gras industry’s petition attacking California’s ban on the sale of foie gras. As a result, the Ninth Circuit Court of Appeals’ mandate goes into immediate effect. It is now against the law to sell foie gras in California. The Animal Legal Defense Fund filed numerous amicus briefs in the six-plus years of litigation, urging courts to uphold the law. 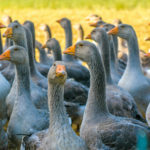 The Ninth Circuit Court of Appeals rules in favor of California’s milestone law banning the sale of foie gras in a unanimous decision reaffirming the law’s constitutionality. The Animal Legal Defense Fund filed an amicus brief urging the court to support the law. Unfortunately, the ban won’t go into effect immediately due to continued appeals from the foie gras industry. The Animal Legal Defense Fund is committed to continuing to fight against legal attacks on this landmark law. Oral arguments are heard in California’s appeal of the Jan. 7 District Court ruling that overturned the state ban on foie gras. 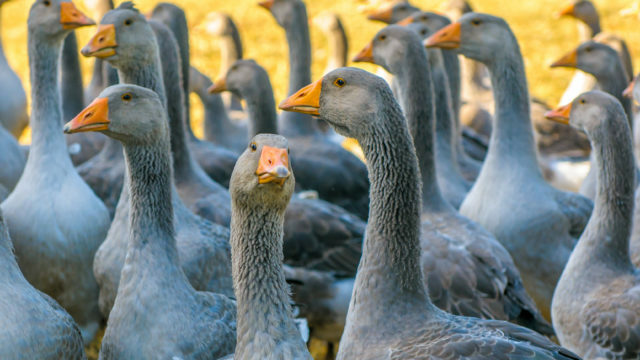 A federal judge grants summary judgment to the USDA in lawsuit brought by the Animal Legal Defense Fund and a coalition to compel the agency to declare foie gras a diseased product. However, the court ruled the Animal Legal Defense Fund did have standing to bring its suits against the USDA. Animal Legal Defense Fund submits amicus brief in support of California’s appeal of the Jan. 7 District Court ruling that overturned the state ban on foie gras. The Animal Legal Defense Fund gives oral arguments in the U.S. District Court for the Central District of California in lawsuit against the USDA for allowing diseased poultry products into the food supply. The Supreme Court of California denies Napa restaurant La Toque’s petition for review, letting stand the appellate court’s decision in ALDF’s favor. The California Court of Appeal for the First Appellate District rejected the Napa restaurant La Toque’s attempt to circumvent the state ban on selling foie gras. California Attorney General Kamala Harris appealed the Jan.7 District Court ruling that overturned the state ban on foie gras; Animal Legal Defense Fund expects the ban will be reinstated. Animal Legal Defense Fund urges appeal after district court invalidates California ban on foie gras. The U.S. Supreme Court declines to disturb California ban on foie gras. The Ninth Circuit Court of Appeals upholds California ban on foie gras. The District court grants the Animal Legal Defense Fund groundbreaking legal standing to bring a “humane” false advertising lawsuit as an advocacy organization, in this case against Hudson Valley Foie Gras. Landmark victory for Animal Legal Defense Fund in lawsuit against Hudson Valley Foie Gras, which agrees to remove deceptive use of “humane” descriptions from its promotional materials. The Animal Legal Defense Fund sues Napa, California-based La Toque restaurant for serving force-fed foie gras in violation of the state ban. Animal Legal Defense Fund files lawsuit against New York’s Department of Agriculture and Markets for allowing the sale of diseased poultry products, known as foie gras. Animal Legal Defense Fund and coalition sue the U.S. Department of Agriculture (USDA) for violating Poultry Products Inspection Act by allowing the sale of adulterated poultry, known as foie gras. After a long legal battle, California’s foie gras ban is in full effect, and restaurants are now unambiguously barred from selling the cruelly-produced, high-priced foie gras. But we need your help identifying restaurants that are flouting the law.